The 1st of May 2007 marked the third anniversary of the accession of the new member states (NMS) to the European Union: the economic balance of the first three years is a clear success for the whole EU. Over the period 2001-2003 GDP in the NMS had increased by 3.1% per year on average; over the period 2004-2006, however, it expanded by 5.3% per year – an increase of the annual growth rate by 2.2 percentage points. In part, this growth acceleration is attributable to the more favourable international environment and the distinctly better growth performance in the 'old' EU; nevertheless the NMS substantially increased their lead in terms of growth over the EU-15: up from 1.7 p.p. in 2001-2003 to 3.1 p.p. in 2004-2006. The catching-up process to the level of development of the 'old' EU has thus accelerated. The aggregate figures for the group show that in 2001-2003 the NMS reduced the gap in per capita GDP in relation to the EU average by 2.7 p.p., and the pace of catching up was nearly a third faster, 3.8 p.p., in the post-accession period. In the field of investments the difference between the pre- and post-accession period was even more spectacular: while in 2001-2003 both the EU-15 and the NMS recorded an only marginal expansion, in 2004 2006 investment growth in the NMS was 4.7 p.p. higher than in the 'old' EU member states. The NMS also became more attractive targets for FDI. And their export growth rates nearly doubled after EU accession: import growth lagged behind export growth, yielding better trade balances. The stronger economic growth reduced unemployment: the aggregate unemployment rate in the NMS declined by 1.7 p.p. in the post-accession period. However, three macroeconomic stability indicators – inflation, current account status and fiscal balance – reveal a more differentiated and less favourable picture than those measuring changes in the real economy. Given the expected continuation of the favourable international environment, the period of high growth in the NMS will continue in 2007 and 2008, except for Hungary. Nevertheless, in all but two countries (the Czech Republic and Hungary) growth rates in 2008 will be somewhat lower than, or only as high as, in 2007, thus hinting at constraints on further growth acceleration. Household consumption remains the engine of growth in the Czech Republic, Poland, Bulgaria and Romania, as well as in the Baltic States. 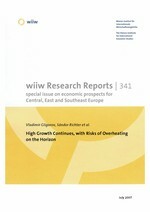 Investments will boom in Poland, Slovenia, Bulgaria, Romania and the Baltic States. Supply-side constraints on a very rapid expansion of the economy will be felt in more and more countries of the region, especially in terms of the tight labour market. There are clear signs of overheating in Bulgaria, Romania and the Baltic States where the external balance has been deteriorating and no turnaround is in sight. Only in Slovakia does very high growth seem to be sustainable at least over the next two years. Inflation will remain relatively low. This is the outcome of the contradicting effect of inflationary pressures from an increasingly tight labour market and its consequences, and the considerable appreciation of the national currencies. High export growth will reflect the favourable international environment and the growing import demand of the region's main trading partner countries, as well as the continuing competitiveness of the NMS. Economic developments in the future member states (FMS) of the EU – the candidate and potential candidate countries of the Balkans – continue to surprise positively. All countries report respectable growth rates of their GDPs, and the growth looks sustainable. Industrial production, a weak sector traditionally, grows faster than GDP, except in Montenegro. Tourism – an important sector in the Balkans – is attracting investments, private as well as public. In general, investments are proving to be an important driver of growth, though consumption is still the dominant contributor. In addition, exports are growing rather fast though so are imports too. These positive developments are supported by the belief in the political and policy stability in these countries. Though external and internal imbalances, i.e. in the labor markets, are still quite large, price stability does not seem threatened. Even in countries such as Turkey or Serbia, where exchange rates and prices are more volatile, the risks of serious crisis are rather low. In addition to macroeconomic stability, the underlying political stability seems to have improved as well. Though no breakthrough has been achieved in the longstanding political problems, progress in democratization is bringing the security and political risks down. Though economies are doing better in the FMS, public and corporate governance as well as structural reforms are not necessarily contributing decisively to that. The most commonly used indices of progress in reforms, business climate and public governance, do not give a consistent picture and certainly do not unequivocally report improvement. The prospects of EU integration have improved during the German presidency and will add to the positive outlook. Growth should stay between 5% and 6%, investments and exports should grow even faster and macroeconomic stability should be sustained in the medium run. Russia's economic growth accelerated in 2007, driven by booming consumption and investments (including FDI). More expenditures on state-sponsored priority programmes and industrial policy measures focusing on public-private partnership projects should foster restructuring and innovations. The wiiw forecast reckons with ongoing reliance on energy revenues and an average annual GDP growth of 5.3% in the coming years. With more money and power consolidation at home, Russian self-confidence will grow further – and this may lead to more conflicts with the West. In Ukraine, strong consumer demand, vigorous investment activity and solid exports have all contributed to impressive GDP growth of 7.9% in January-May 2007. Rising consumption and housing construction are increasingly driven by expanding consumer credit, not least due to the growing presence of foreign banks. However, we expect economic growth for the year as a whole to be somewhat lower, between 6.5% and 7%. Imports growing faster than exports will translate into a rising current account deficit, possibly up to 4% of GDP in 2007 and even higher next year. The prospects for greater political stability in the country remain bleak. GDP grew by 11.1% in China in the first quarter of 2007, faster than expected by most experts. Obviously, the official efforts to contain growth have so far not been successful. The economy was driven by a rebound of investment and by a ballooning trade surplus, but supported by a certain acceleration of consumer demand as well. Recent data point to a continuation of the rapid expansion, which may result in a growth rate for the whole year between 10.5% and 11%.